What Do My December 2018 CFA Results Tell Me? Examples Included. What Do My CFA Results Tell Me? Examples Included. Important! December 2018 candidates can expect their CFA exam results to be released on Wednesday, 23 January 2019. We keep our fingers crossed for you! Important! The December 2018 pass rate is 45%. Congrats to all candidates that passed their exam! Do you want to start your prep for the next exam (level 1 or level 2)? The e-mail message will tell you whether you PASSED or FAILED. Also, you will learn about your performance for given topics relative to other exam takers (go to your CFA Institute account for more details). This information can help you in your preparation for future exams. *Results are also available on the CFA Institute website from the level of your account. When and How is the MPS Set? What’s the New CFA Results Format? How High Are CFA Pass Rates? What to Do if You FAIL Your CFA Exam? What to Do if You PASS Your CFA Exam? To pass your CFA exam, you have to meet the minimum passing score (MPS) set individually for each ended exam. The MPS may vary across years. Both the MPS and individual candidate score are never released. if you FAILED you were below the MPS or the ethics adjustment worked to your disadvantage. For those who failed, an option of exam score retabulation is available for 30 days after the results are released. It is checked manually if the exam scores were recorded and added correctly. The service is paid (USD 100) and refundable only if your released CFA exam grade is found to be incorrect. The exact MPS value is set by the CFA Institute Board of Governors who gather about 6 weeks after the exam for level 1 and level 2 and again about a week later for level 3. The set MPS value falls within the valid range established using the modified Angoff method, which provides an empirical basis for the MPS settlement. Applying the method, a large and diverse group of CFA charterholders assesses both the exam difficulty and actual candidate performance before the MPS is finally determined. So Much Info and You Still Feel Like You Know Nothing? You’re right. CFA Institute is very secretive about our results and hardly any hard facts can be given to narrow the information gap. Let us, however, wrestle a bit and try to draw some conclusions from what we know. First, we need to set some common ground. Let’s take the CFA level 1 exam. There are 2 exam sessions, each containing 120 exam questions. That makes 240 questions for the whole level 1 exam. If we assume every question is worth 1 point, we end up with the maximum total score of 240 points. For an incorrect answer, no points are deducted. Myth no. 1: The minimum passing score is above 70%. Myth no. 2: I have to pass all the topics, to pass my exam. Myth no. 3: I can’t do badly in Ethics! There’s Ethics adjustment! Myth no. 4: Topic performance objectively indicates which topic areas definitely need improvement and which are fine. Assume the MPS of 75%. You are notified about your CFA level 1 exam result. In the topic performance information, you see you scored above 70% for every topic. Still, your exam score message says you FAILED. You feel confused: “How come I failed? All my topic scores are above the 70% threshold which according to CFA Institute is a reasonable signal of topic mastery”. That is why it is impossible for the MPS to exceed 70%. Otherwise, you could always end up confused about your exam results like in our example. To make the situation described above more clear-cut, let’s analyze it bit by bit. From your topic performance information, you know you scored above 70% for each topic. So, your total score must have been above 70%. But since you know you failed, it must have been lower than the MPS (below 75% for our example). Perhaps you achieved 72% for each topic. You didn’t reach the MPS and that’s why you failed. 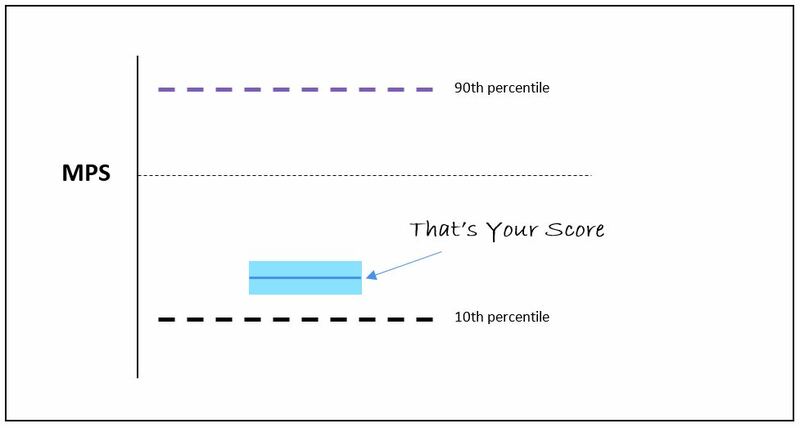 Even if our example is just a simplification, it shows well that for the MPS values above 70% there’s practically always a gap for those who may fail their exam despite having all their topic scores in the mastery range. Quite an undesirable situation for the candidates whose exam performance is on the verge of mastery, don’t you think? If the MPS is above 70%, the grading system fails to be transparent. Thus, it’s most probable that usually the MPS fluctuates between 65% and 70%. But what does it actually mean to pass a topic? To score over 70%? Or to be above the MPS for the topic? What you need to do to pass your CFA exam is to meet or exceed the MPS. But it holds true for your total exam score, not for separate topics. That’s a major principle! Of course, if you score over 70% for every topic, it should ensure your passing the exam (see Myth no. 1 above). *This is our assumption. CFA Institute never gives you exact scores or releases the MPS. Does it mean the e-mail message says you FAILED? No! 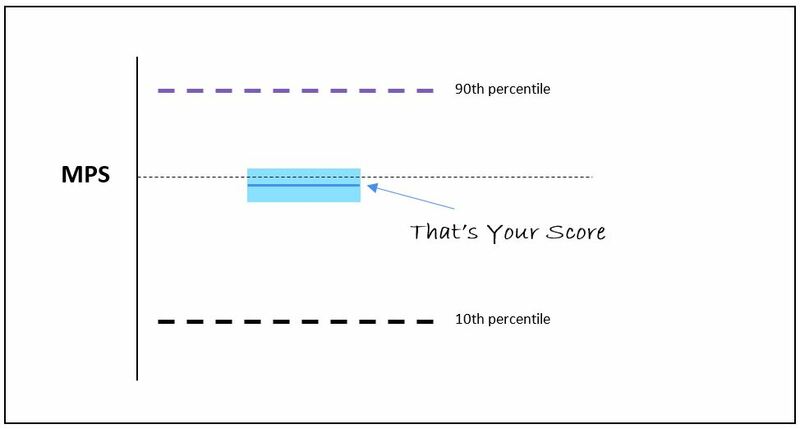 The example illustrates how various scores for different topics still give you a PASS because you managed to meet the MPS of 69% set for your exam. Your total exam score is what counts! As a rule, to pass you must meet or exceed the minimum passing score set for your exam. The math is merciless, however. If you do badly for any of the topics, you have to excel at some other. In other words, every topic scored below the MPS has to be offset by another topic scored way above the MPS. This way, your total score can meet the MPS criterion and you pass. We’ve just said that the major principle behind passing the exam is meeting or exceeding the MPS. In the CFA level 1 exam, the maximum value of points for Ethics is 36. You must have gotten only 12 questions right because you scored only 33%. But wait a minute. Other scores are great! It’s impossible you failed your exam. 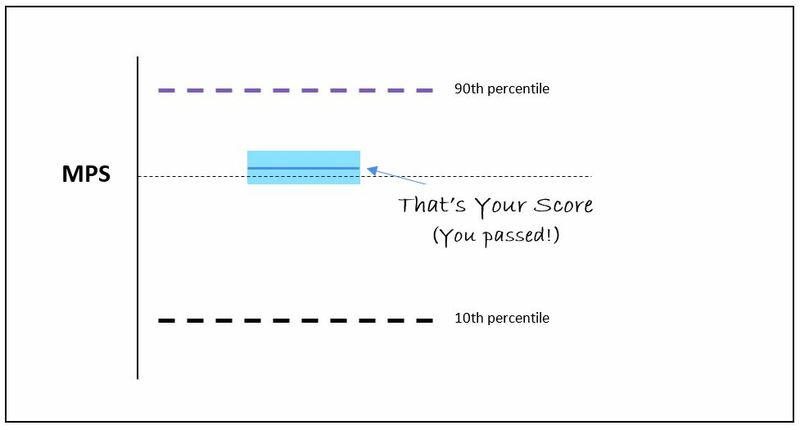 Your total score exceeds 70% by far, so it also exceeds the MPS of 67% set for your exam. You may not manage to exceed the MPS much enough. If your final score just borders the MPS, poor performance in Ethics will definitely contribute to your failure in the exam. That’s because of the Ethics adjustment explained in our post: Why Your Ethics Score Matters. 1. The significance of ethical conduct at a workplace is unquestionable. The better you know the CFA Institute Code of Ethics and Standards of Professional Conduct, the more sensitive you’ll be to possible violations and better equipped to handle various situations. 2. You will be tested on Ethics at every level of your CFA exam and every time Ethics will be counted among the most important topics. 3. Ethics adjustment is applied to borderline cases. A good grade for the Ethics questions may pull you through if your total exam score borders the MPS. But if your Ethics performance is weak, it may cause you to fail the exam. Note: Free Ethics videos are available for Soleadea users only. Click to set up your account (4 mini-steps only) & enjoy free videos inside your personalized study plan. THAT’S RIGHT! It’s not all that easy. You scored poorly for Alternative Investments. Before the exam, you felt quite strong on the topic. What to trust? The numbers or your intuition? Your Dec 2018 level 1 exam included only about 10 AI questions, while the topic runs for about 100 pages in the CFA Curriculum. So, the AI exam sample was quite small relative to the overall material on the topic. Notice that if you answered correctly just one more question, your AI score would be higher by as much as 10 percentage points. That would shift you up quite a bit! So: Is AI definitely your weak point or was it just bad luck? You scored poorly for Financial and Reporting Analysis. Weakness or misfortune? This time the exam sample is bigger. The topic is quite extensive and your Dec 2018 test was expected to contain even as many as 48 FRA questions. 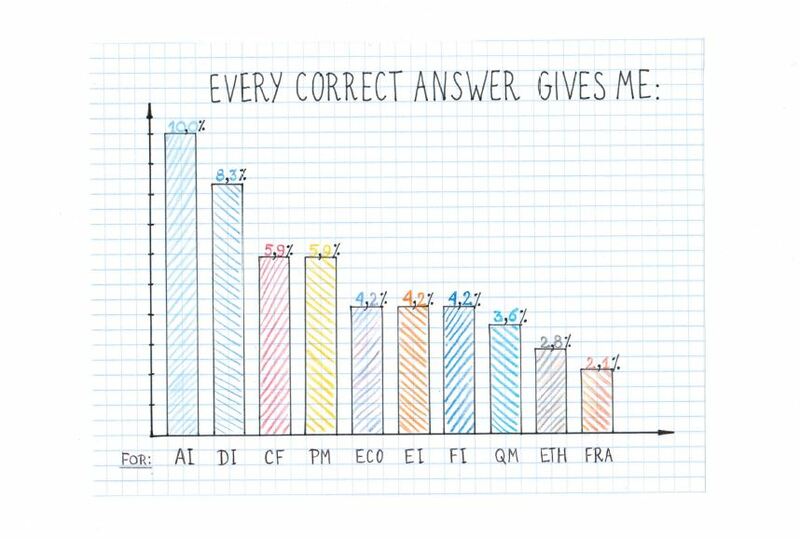 Every correct answer improved your topic score by roughly 2 percentage points. For some topics, there are too few questions on the exam to definitely categorize them as your weakness or strength. In such cases, it may be hard to decide whether you know the topic poorly indeed or if it was just bad luck (or good luck for that matter because although you scored over 70%, you feel you still don’t know much about the topic). For topics with a bigger number of questions, exam results are more representative. It is more likely that they really indicate whether you need to improve the topic or if you managed to master it already. You have to stay rational about it. To resolve doubtful situations in which your exam performance contrasts your intuition about a topic, an additional parameter may come in handy. Your mock exam scores can serve as good indicators. If you usually scored rather low for AI, and now your AI exam score is also poor, you definitely need to improve this topic area. If, however, you scored high in all the mock exams you took, the low exam result for AI may be just an accident. Still, it can’t harm you if you study even harder before your next exam. NOTE: Together with the introduction of new CFA results format, CFA Institute merged the DI and AI topics together in the topic performance information. That's because for the AI topic the confidence interval would be the widest owing to the lowest number of AI questions in the level 1 exam. So, basically what your AI topic performance would tell you would be this: 'You know, your true ability for AI is either MUCH higher or MUCH lower than your AI score obtained in the exam' (which is really like telling you nothing). As soon as DI and AI are merged together, they can be presented like one topic with the exam weight of 9%, which gets similar to EI, FI or ECO. Note: Free AI & FRA videos are available for Soleadea users only. Click to set up your account (4 mini-steps only) & enjoy free videos inside your personalized study plan. THAT’S RIGHT! The thin dashed black line is the MPS set for your exam. The thick blue line is YOU. In Jan 2018, CFA Institute introduced this new – more visual – way of informing CFA exam takers about their scores. More visual means more attractive. However, it still lacks the transparency and concreteness CFA candidates long for. In line with what we’ve already said, no concrete value is attributed to neither the blue (YOU) nor the black (MPS) line. Moreover, if your score is close enough to MPS, your blue line may even overlap with the black MPS line, which – unfortunately – will not always mean you passed :/. a thick black dashed line telling you that only 10% of all candidates scored lower than that. 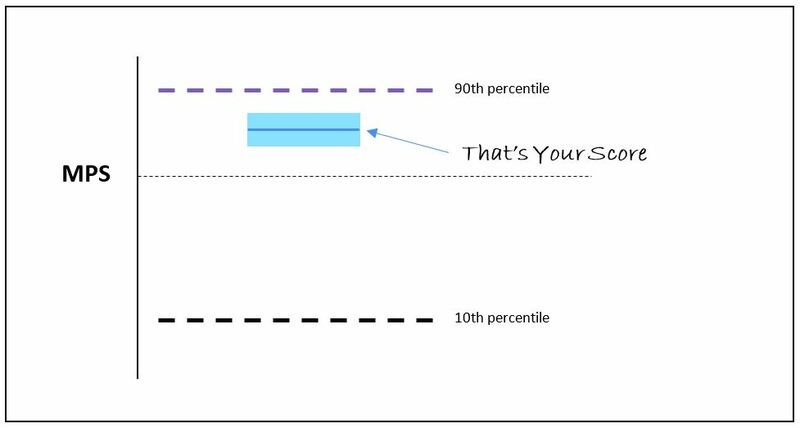 Last but not least, because different favorable & unfavorable factors may influence your exam score – you will find your thick blue line inside a light blue box (confidence interval). This is to show your true ability, which might be higher than the line (but on the exam day you had to face some unfavorable circumstances) or lower than the line (but in the exam you worked under favorable circumstances). The fact that CFA Institute is trying to allow for additional factors is actually good! your topic performance compared to other candidates (thick dashed purple and black lines – indicating 10% of the best vs worst topic scores). These estimations are all set against the MPS-like 70%-value thin black line which is considered to indicate 'topic mastery'. Your topics performance is generally presented using separate blue lines (for Dec 2018 candidates DI and AI are an exception here being coupled together, see Myth no.4). Level 3 candidates will also find a similarly presented ‘essays vs item sets’ comparison showing their performance in the exam. You need to realize one thing, though. It’s almost 50% for levels 1&2 and a bit over 50% for level 3 but of all candidates who actually took their exam. The pass rates do not include those who prepared for the exam but decided to stay at home (‘cos they were ill, unprepared or otherwise indisposed). So, the effective CFA pass rates are in fact lower even by 25%. Yep. That many candidates chicken out before their exam! And we’re using this phrase on purpose because the vast majority out of this 25% were neither ill nor indisposed. They were simply so totally unprepared, they didn’t even want to give their exam a try. This seems particularly true for the CFA level 1 exam, where many candidates take their exam for the first time and don’t know yet what CFA exam prep entails. Aware of the huge numbers of those badly prepared, we help all CFA candidates – regardless of their exam level – stay on the right track with their preparation. Our free CFA study planner is based on 3 pillars: control, motivation, and knowledge retention. If you follow our guide, you’ll get yourself responsible and productive exam prep. Should you execute your study plan week by week and learn efficiently while studying, you’re bound to find yourself among those who passed . What to Do if You FAIL Your CFA Exam? And if You PASS? After you receive your CFA exam results and let the news sink in, you’ll be surely asking yourself this one little question: OK, what now? Look at your blue line showing your overall performance in the exam. Compare your CFA topic results. Analyze the exam prep you had before your exam. Write down all your conclusions. Start your next preparation at least 5-4 months before your next exam. Have your own personalized CFA study plan and make sure you follow it. Read on for the details. These depend on your personal exam experience. So, you are close enough to the MPS line to get a bit angry that you didn’t make it? Bummer… Keep your spirits up, though. It means you did quite a good job overall. OK. There are things you’ll need to improve. But the chances are high that your next CFA exam will be a success. Below we help you identify your weak points, tell you what to focus on to improve, and suggest the best way of studying for you. Take your time and scrutinize your topic performance. How many blue topic lines were over or close to the 70%-line and how many – way below? Focus on the latter ‘cos they indicate which topics you definitely need to improve. However, while studying don’t get tempted to neglect the topics you did well at this time. What you need to do is regularly review the contents of these topics and study the bits you felt insecure about. Your next exam may test you on different areas of the topics than it did this time. NOTE: The visual presentation of your topic performance is meant to help you draw some useful conclusions and aid you prepare for your next CFA exam. Even if it’s far from ideal, it has some valuable information for you if you can give it the right meaning. Topics analysis is one thing. But then there’s also an issue of your attitude. There’s always something we can do better. Think what it is for you when it comes to the way you study. Perhaps you lost too much time not following your study plan but postponing your study hours? Or you had no study plan at all?!?! Maybe you practiced too little leaving tests till after you read all the topics? That’s a mistake. You should do exam-type questions systematically all over your exam prep. Practice and theory should intertwine. Then, there’s also an issue of review. Few CFA candidates do it on a regular basis (perhaps that’s why the pass rates are so low…). In your case, spaced revision throughout whole exam prep (not just a week or two before the exam) is especially important! Why? Because while you focus on the topics you need to improve, you also need to review the topics you did well at to make sure you lose no points here next time. Better plan? More practice? Spaced review? As soon as you know what to change about your exam preparation, write it down and pin the list in a visible place. It’s the best way to hold yourself accountable. As time passes, all your resolutions will start to fade. But then it’s all there – written down point by point. A sheer look at the list reminds you of what you want to do better this time. It’s up to you to decide how many months of preparation you need. But we’d like to encourage you to make it at least 5-4 months. This is an average study time period for CFA candidates. The shorter your exam prep is, the more intensive it needs to get. Otherwise, you risk ending up with a result like the one you got lately. You certainly need a good study plan. And we’re not saying it because we have this free CFA study planner for you. We’re saying it because there’s no other way you can successfully control your whole exam prep. You need to take so much into consideration, now also your personal topics experience, practice needs, spaced review, or whatever it is you want to improve. When using our study planner, you can choose the difficulty for all topics according to your topic performance in the previous exam. You can also control your progress week by week by summarizing your weekly study achievements. If you opt in for our paid program, you’ll get major motivational boosts (e.g. your chance to pass) hand in hand with top study hints. Also, your review sessions will be properly scheduled in your study plan and some extra tools will be available for you to practice more. So, you are close enough to the thick dashed black 10th percentile line to get scared you’ll never make it? Not the way you imagined? Here’s what you need to do >> You need to rethink your approach completely! Ask yourself why you WANT to become a CFA charterholder (and how much you WANT it?). Then >> Follow our guide: take this revolutionary road and experience revolutionary effects . Not too many satisfactory scores, huh…? Generally, you’ll need to work hard for every topic before your next exam. Unless there’s a topic you did reasonably good at. Perhaps you widely use this topic’s concepts at work? Or you simply studied this topic more thoroughly? If the latter’s the case, try to build on this experience and think what exactly made this one topic score different than others? Even though you feel devastated by your CFA exam score, you need to know one thing. Not all of your exam prep was a fiasco. There were some bad things and some good things about it. Now it’s time to face the truth and call it all by name. What did you do right? What did you do wrong? This is probably the biggest step for you. Unless you can draw some meaningful conclusions, you won’t be able to carry on successfully. This is the only way to take your next exam prep seriously. Divide a sheet into two. Make the TO DO list and the NEVER TO DO list side by side. If you don’t make it, your next exam prep won’t be any different. Again: out of control, poorly executed, and letting your goal get out of perspective. 5-4 months is an average study time period for CFA candidates. However, the shorter your exam prep is, the more intensive it needs to get. Bearing in mind how much work there’s in front of you, you should aim at a sufficiently long exam prep for you. 5 or 4 months may not be enough but we make even 8-month study plans available to our users. Your next CFA exam prep needs to be revolutionary. That’s why you need a study plan that makes you work! Use this free CFA study planner to stay in control of your preparation. Personalize your study schedule so that it fits you. If it fits you well, it’ll be easier to follow. While customizing: (1) choose your start date; (2) specify which topics are easy, moderate, or difficult to you; (3) plan your holiday weeks (especially if you’re opting for more than 5 months of preparation – some rest will do you good! ); (4) sign in for motivational messages if you feel you lack motivation and a proper review system if you don’t know how to study efficiently. You’re on the right track. Just keep on going . Congrats on passing your CFA exam! The next level’s waiting for you . New exam means a new challenge and new rules. You’ll do best if you start your new preparation with the analysis of your recent achievement. Because the closer you are to the MPS line, the more you may want to improve about your studying process. Start your analysis by looking at your topic performance. First, look at your Ethics score. Remember you will be tested on the same Code and Standards at each level of your CFA exam. Your latest Ethics result can tell you a lot. If it’s highly satisfactory, it says you should keep on studying Ethics the way you did (also, to a certain extent, it may be a good benchmark for studying other topics). If your Ethics score is unsatisfactory, you know you need to be more serious about this topic now. Also, pay attention to the topics you scored the lowest. Aren’t they your Achilles heel or was it just an accident? That’s important because topics often share some common concepts across exam levels. Identify all the topic areas common for your previous and next exams. Then, think how well you know it and how much you’ll need to improve. You never err by asking yourself what you did right and what you did wrong. Your exam prep is no exception. This way you develop your skills and competencies and you grow both as a student and as a human. Perhaps you’d like to be more organized and regular about your study hours? Or maybe you struggled with the motivation to study? Finally, you surely neglected spaced revision. Obviously, it was a mistake because it’s the best way to keep your learning curve up, not falling. Better organization? Maintained motivation? Study content revision? All this may be on your growth list. Your next CFA exam prep needs to more advanced than the previous one because your next exam is going to be more advanced than the one you just passed. And we hope you’re not going to take it easy now just because you were successful once? Your next success is not coming cheap – you need to earn it! If your previous exam prep was longer than that, feel free to stick to your way. All we’re saying is that the majority of CFA candidates do 5-4 months of prep. You need to choose what’s best for you and – since you already had quite a successful exam prep – you surely know it best. No matter the prep length – just make sure it’s approached responsibly and productively! A good study plan is a must for every successful exam preparation. We hope you agree. Here you can create your free CFA study planner and personalize it according to your needs. It puts you in control of your whole exam prep. Week by week you see your progress as you study your CFA readings. With our paid plans, you also get to know how long to study each reading. These estimations can be particularly helpful since you have no experience in preparing for the next CFA level. 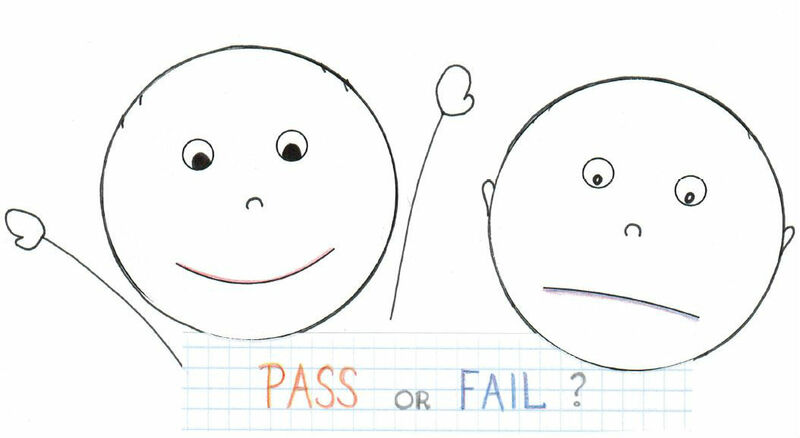 To keep your motivation strong (and to add some fun to studying), you’ll also get your chance to pass estimated and illustrated. It grows when you’re doing fine, i.e. when you mark your CFA readings green for done, summarize your study achievements week by week, or do your spaced revision sessions scheduled throughout your whole preparation. Good luck with your upcoming prep!